Chemistry principles for selective conversion of redox modifications and the analytical workflow of redox proteomics, as developed by PNNL scientists. Redox proteomics is a powerful tool to study the mechanism of cellular regulation in various organisms such as bacteria, plants, and mammalian cells or tissues, and to identify novel functional regulators. Enlarge Image. Results: In all organisms, reduction-oxidation—or "redox"—regulation is essential for many biological processes, including metabolism, gene expression, and environmental and stress responses. Key to understanding these processes is being able to determine how the post-translational modifications (PTMs) of proteins, which occur in this case on their cysteine residues, contribute to creating "redox switches" capable of regulating protein functions and protein-protein interactions. Researchers at Pacific Northwest National Laboratory (PNNL) recently developed an efficient method for enriching and quantitatively analyzing PTMs of cysteine residues of proteins using a commercially available resin. 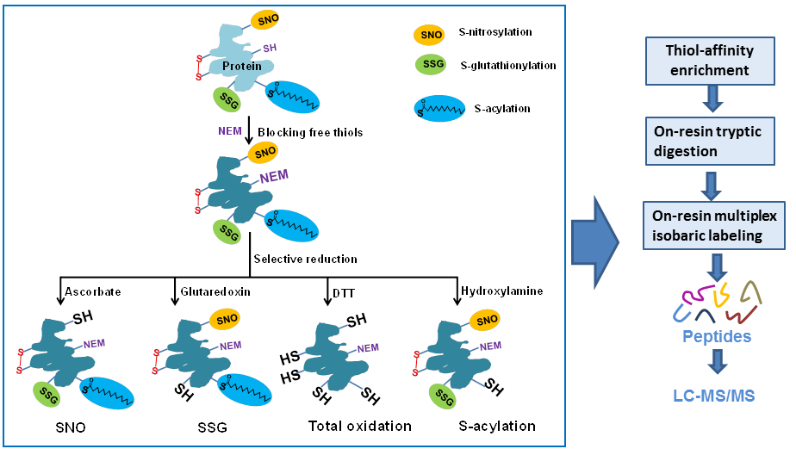 The team's innovative approach more quickly and efficiently reveals information about cysteine thiols and associated "reversible modifications," which affect protein activity, conformation, interaction, and other characteristics. Starting with tissue or cell lysate samples, the method involves using a resin, thiopropyl Sepharose 6B, to selectively capture the derivatized cysteines bearing reversible modifications. The procedure was effective and efficient in enriching—or delivering higher quantities—of pertinent cysteine thiols for analysis. It's anticipated the team's advance will offer broad applications in biological studies by serving as a general enrichment strategy for multiple types of reversible cysteine modifications. Why It Matters: Research has shown cysteine thiols in proteins frequently participate in enzymatic reactions and are subjected to a variety of covalent PTMs, or changes that can significantly impact protein behavior and functioning. "The biological significance of several types of reversible cysteine PTMs has increasingly been recognized, as they have been found to modulate protein function in a variety of biological pathways," said Dr. Jia Guo, a researcher from PNNL's Integrative Omics group. Enrichment of cysteine thiols traditionally has been achieved using the biotin-switch technique (BST), a method that has greatly advanced knowledge in the field. However, BST is labor intensive. Also, there may be instances where the technique captures the wrong target subjects during the enrichment process. "Our resin-assisted approach is simpler because it facilitates the direct covalent capture of thiol-containing proteins," Guo explained. "Subsequent steps in the process negate the need for sample cleanup prior to mass spectrometer analysis, saving a significant amount of time." Considering that much remains to be learned about cysteine-based reversible modifications, the PNNL-developed innovation is a key step toward more rapidly expanding knowledge in this field. Methods: The team tackled this challenge by integrating chemical derivatization, specific resin-based enrichment, and advanced mass spectrometry to achieve quantitative measurements of specific types of modifications. In its inquiry, the researchers employed S-nitrosylation-modified peptides enriched from mouse muscle. The technique's workflow starts with direct capture of derived free thiol-containing proteins onto the thiopropyl Sepharose 6B resin, followed by the breaking of remaining protein chains into smaller chains on the resin, then multiplex isobaric labeling—also on the resin—and, finally, extraction of the captured peptides. The labeled peptides are subjected to liquid-chromatography-mass spectrometry to identify specific modified cysteine residues and quantify reversible modifications. Although there are potential limitations in the method, the research team believes the resin-assisted approach represents clear progress in identifying novel cysteine sites sensitive to redox or other reversible modifications. "Our approach can help build knowledge of cysteine-based reversible modifications by helping to overcome challenges associated with isolating, identifying and quantifying the modifications," Guo said. What's Next: Researchers are applying the methodologies to studies of redox regulation and signaling in cyanobacteria relevant to biofuel research. The approaches also are being used in a mammalian tissues inquiry examining the role of redox regulation in oxidative stress-related diseases. Sponsors: U.S. Department of Energy (DOE) Early Career Research Award, DOE Office of Biological and Environmental Research's Genomic Science Program through the PNNL Pan-omics Scientific Focus Area, and the National Institutes of Health Director's New Innovator Award Program. Research Team: Jia Guo, Matthew J. Gaffrey, Dian Su, Tao Liu, David G. Camp II, Richard D. Smith, and Wei-Jun Qian, all PNNL.